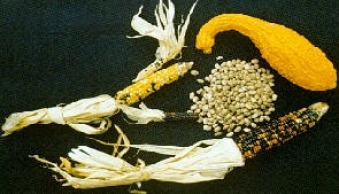 What did Eastern Woodland Indians use for food? This is how Eastern Woodland Indians hunted. The Iroquois used a bow and arrow to hunt. They would sometimes wear the skin of a deer over their body to sneak up to the deer. During the winter, they would get maple syrup from trees. The liquid was put in wooden troughs and stirred day and night over a fire. After a long time the liquid syrup changed into sugar. All of these things the early American settlers learned from the Indians and they are still part of our daily lives today. Remember whenever you have corn, or pancakes with maple syrup, these things came from the Eastern Woodland Native Americans.